It has been a great weekend. Friday night we went to the Arvest ball park for "Faith and Family Night" that 101.1 KLRC put on. Amy and Tony were with us too. Francesca Battistelli sang before the Naturals baseball game. Here we are during the concert. She is quite talented! Amy and Tony had such a good time too! There was also a group from Wild Wilderness Safari there. They had quite a few different animals there too...including a ....boa constrictor.....eeek! HA! Here is a baby lion! And look! A baby monkey! HA! How cute! After the game, there were fireworks! They were so awesome! We always love having a good time with friends! Yesterday we relaxed a little bit and then went to see the movie Up. It was soo cute! I think some of our friends are going to go see it on Friday night and we enjoyed it so much we may just go again! :) After the movie, we went to eat at a local Italian restaurant! YUM! Hope ya'll have a great week! Wow! The weather this week has been so beautiful! I have been outside so much this week, whether it's walking around or playing with Belle outside! Also, I have been thinking about cooking lately! I just got this cookbook yesterday! 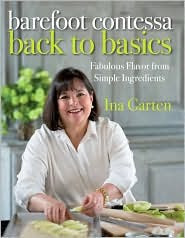 Ina Garten's Back to Basics is so good. My sister got this same book not too long ago and she loves it. Last night, Russell and I went to Cracker Barrel for dinner. They had the neatest things for Summer! 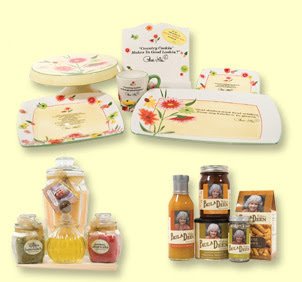 But my favorite was the new and exclusively for Cracker Barrel, On the Veranda by Paula Deen! There are decorative plates, platters, candles and more! 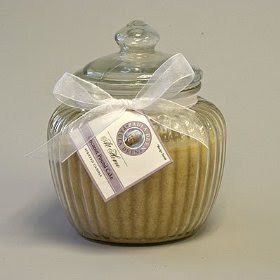 Oh and this candle smelled so good! I have definitely been thinkin of Summer lately. 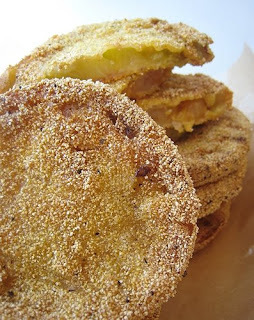 When I think of Summer I also think of Fried Green Tomatoes! Oh I need to fix these soon! 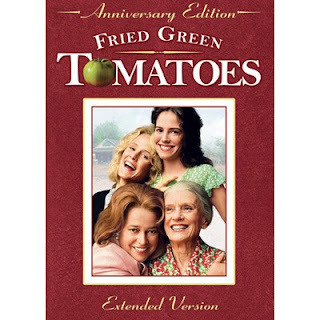 And of course, I can't think of fried green tomatoes without thinking of the movie! I absolutely love this movie! I am just sharing my thoughts today! Today, Mama, Jackie and I hosted a baby shower for my wonderful friend, Amy. She expecting Leighann in July! The picture above is a heartbeat bear which Amy got a little while back. It actually has Leighann's heartbeat when you hug the bear! Also, there is an ultrasound picture and baby book. Here is the Berry Punch I made and I got to use my drink dispenser! We had to snap a quick pic of us before the shower! And here is the fruit carriage! I got this idea from Bekah's baby shower and I just had to try it for Amy's shower! 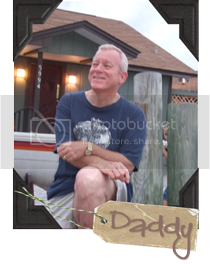 But I have to give props to my father in law, Ricky! He worked on this so hard! I made my first diaper cake for this shower. I think it turned out pretty good. Amy took this home with her today! OH and Robin made these beautimous cookies which were soo yummy! Thanks Robin! She is getting famous for these cookies! They are just so precious! Oh and we played the "diaper game" too! Amy got so many monogrammed gifts! We had so much fun! We all love ya, Amy! It's Friday, ya'll! I love Fridays! This weekend will be a busy one! I have been getting ready for company! Jackie, Mama and I are hosting a baby shower for my best friend, Amy tomorrow. Ricky, Jackie and Mama are all coming here tonight and Uncle Ron and Aunt Debbie (Amy's parents) are also coming today for the shower! 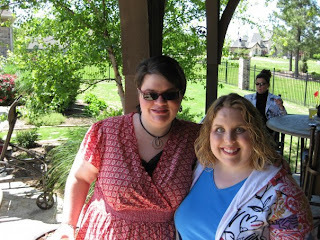 This past Sunday, Russell and I went to a couples shower for Amy and Tony. We had a lot of fun. 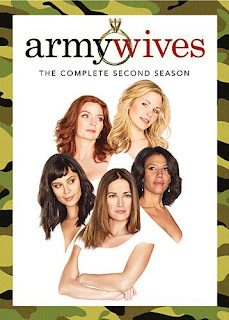 So, Army Wives Season 2 comes out on DVD very soon! I can't wait to get it! I know my friend, Adrienne can't wait til season 3 begins on June 7th! HA! (HEY Adrienne!) :) I am looking forward to it! Well, I hope you all have a fabulous weekend! I know we will with our family here! Tonight is VERY EVENTFUL! We watched American Idol last night, we VOTED for hours on end until midnight for Kris. We watched the result show tonight and WOW! It all payed off! 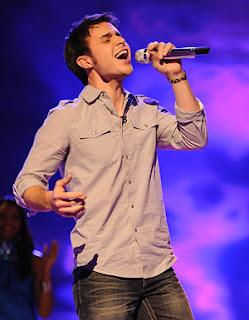 Kris Allen won American Idol 2009!!!!!!! He is from Conway, AR! GO Arkansas!!!! I just had to share my happiness with ya'll tonight! We will go to the concert in July! YAY!!! A precious little boy, Sam, who lives here in Bentonville, was recently diagnosed with a cancerous brain tumor. He had it removed today, I think. I felt I needed to immediately post this. As all of you know, people with brain tumors are especially close to my heart. I do not know any more details, but PLEASE PRAY for Sam and his family! I will update when I know more. Happy Birthday Kelly! 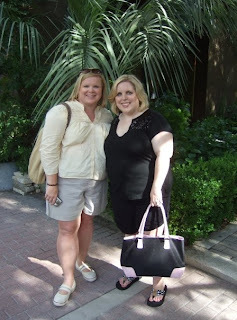 This is a picture of me and my sister and best friend, Kelly. We are 13 years apart in age! For Mama and Daddy, it was like they had one only child, and then one only child! Because once I started Kindergarten, Kelly went off to UCA with Eric! Here we are on Kelly's wedding day with our cousin, Jennifer. I was a junior bridesmaid in her wedding. She was my Matron of Honor in my wedding! Happy Birthday to the sweetest sister ever! I am so blessed to have you as a sister and a best friend! I love you, Kelly! Belle's Day at Bark Park! Bentonville Bark Park! The grand opening for it is this Saturday but there have already been many dogs at the park. It is a leash free park where dogs can just run all around and play! Here is Belle laying out in the sun! It was VERY windy too! HA! Come on Belle! She was too scared to go through the tunnel. We had a great day at the Bentonville Bark Park. Oh and did you know that a little girl thought of this idea?!! YES! A local Girl Scout who lives in our area thought of this as a Girl Scout project! I think that is so awesome! And here is Belle tuckered out! She is about 8 months old now! WOW! Ya'll! I can't seem to get my pictures right on here! I would really appreciate yall if you could tell me how to organize mine better! Russell's best friend, Todd has been here for a few days. He left this morning but I am positive that Russell and Todd had a great and eventful time! Friday all three of us went to Branson to see the Baldknobbers Show in Branson. Yeah, funny name I know. But it really was a great show. Good for families too! Saturday we traveled to Springdale and ate at Lambert's Cafe. Todd is a good ole country boy and he is proud of it too! So he was in his element! Lambert's Cafe is home of the throwed rolls, you know! They really throw the rolls to you! After that, we went to Bass Pro Shops Headquarters. It was fun. See me in that camo recliner? HA! I wouldn't ever have one of these in my house unless we had a big house with a hunting/camo room! We told Todd he had to bring his fish frier to NWA just so he could fry his fish for us! He is famous for fried fish, fries, hush puppies and my personal favorite.....FRIED BISCUITS! YUMMM! Here they are! 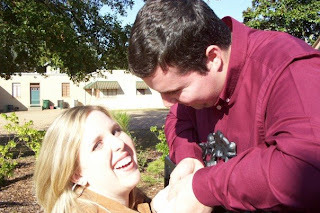 Four years ago today on May 7, 2005, Russell and I met. Amy Talbert, his cousin, introduced us. I used to go to Mamaw & Papaw Price's house a lot with Amy on Sundays for lunch. I saw Russell's senior picture and I just thought he was SO handsome! "I will have to meet him," I said to Amy. I met his parents, Ricky and Jackie once too. But I didn't think Russell would be interested in me. Well then Amy and I seriously started talking more about how Russell was and what he was like. The more I thought and talked about it, the more I was interested in meeting him. I got very anxious to call him and Mama always told me to "never call guys". But she actually wanted me to call Russell! So I called his house first. Jackie answered, I was totally embarrassed but I said, " Hi this is Meredith Jordan,is Russell there??" Jackie said, "Oh well he isn't but, do you want his cell number?" HA!! Anyway, I called and talked w/ him. We then called one another a little bit after that. I called my cousin, Jennifer on May 7th to tell her how nervous I was. She said that she and Matt could go with us to El Dorado and see a movie. I felt a little relieved. So we finally met! Russell came to my house in Camden and I was just SO nervous. I opened the door and I thought, "WOW he is SO TALL!" HA! Anyway, the two of us went to Bentley's and then back to my house. Matt and Jennifer met us there and we all went to El Dorado together. I was so excited. Matt and Jennifer didn't eat yet, so then we went to Good Times Grill and then to see Sahara at the theater. Jennifer took this picture of our blind date. I love this picture. This picture was taken soon after we were dating. 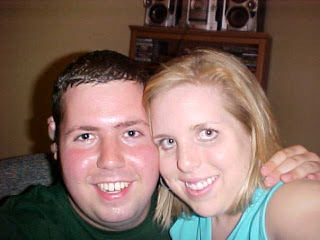 It was still May of 2005 and as you could tell, we fell in love for one another fast! The one below that, was taken 6 months after our first date at the Wilson Gardens in Magnolia. Four years later, we are happily married and thank God every day for one another. Russell is the best man ever and I can't be more grateful for him than I am right now. Show Us Where You Live Friday-In The Kitchen! Oh I have to say I just love my kitchen! The first thing we see when we walk in our house from the garage is this frame and mirror. our kitchen! We just moved in our house in October of 2008 so we are still working on little things here and there for our house (kitchen included). But, see we have everything we "need" but I have to say I love decorating! Do ya'll have a butter bell? My sister introduced me to one and she, my Mama, and I use them a lot and love it! It is supposed to keep your butter soft and its just neat, I think. Also, is my May calendar! When we saw this house, the first thing we loved about it was this dormir window. It makes the kitchen, our living room, and dining area so bright and pretty when the sun shines through this window! Anyone who really knows me at all knows I LOVE to cook and I LOVE cookbooks! It is funny, but I was looking at these and I noticed, they tell a story about my life in a way! HA! I mean,I have one of my Nanny's cookbooks, I love Paula Deen, and I have many of hers, I got a lot of Gooseberry Patch cookbooks for our wedding gifts over a year ago, and on our honeymoon, we went to Disney World and got "Cooking w/ Mickey" cookbook. Ya'll get the idea! HA! Well I hope ya'll enjoyed coming to my kitchen!